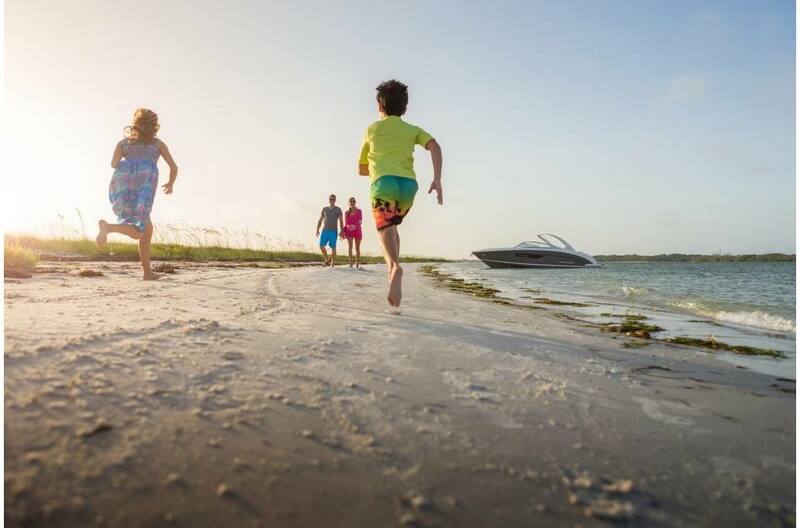 Discover the potential of day yachting with Regal's 3300. Eloquently crafted with versatility and the luxury that is promised in every Regal. The spacious layout lets you comfortably accommodate up to 18 guests and entertain them well. Whether you seek adventure, relaxation or both, the 3300 gives you the ability to do it all. Lighter. Stronger. Cleaner. Infusion. 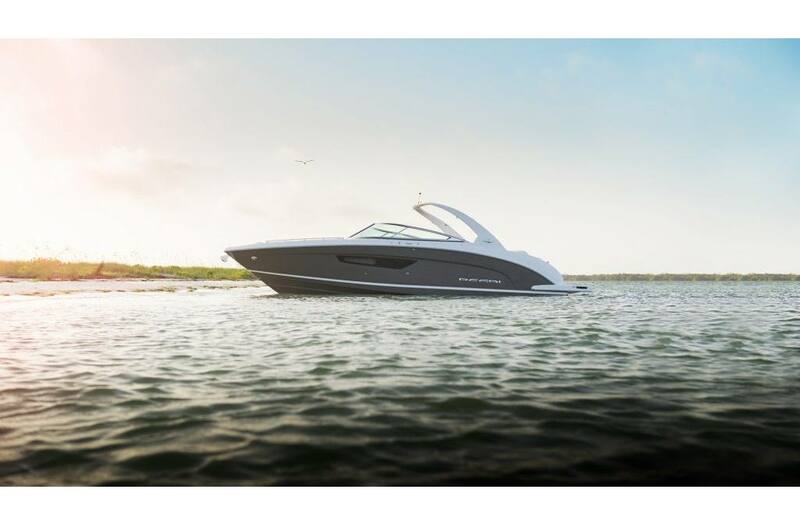 : Thanks to the advancements in boat building technology we are able to craft our boats lighter, stronger and with a perfect glass to resin ratio, every single time. 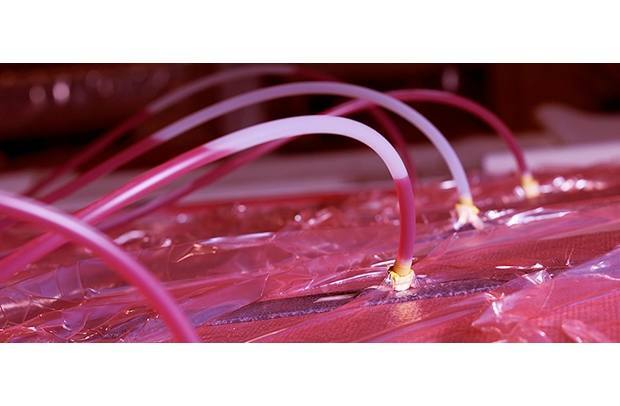 This means better fuel economy, higher performance, and a greater peace of mind. 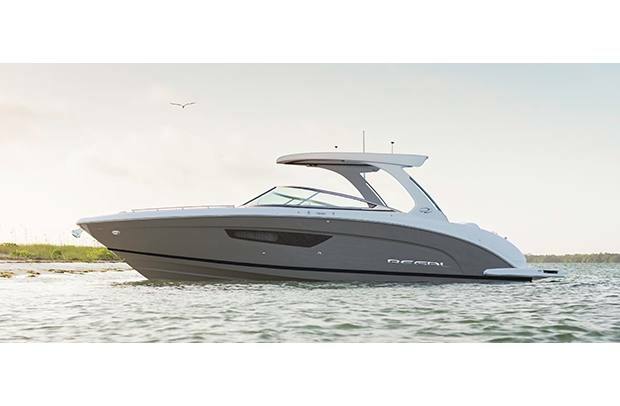 Power of Choice: Enjoy the same brilliant layout of the 3300 with the possibilities of outboard power, explore the Regal 33 OBX. Up-to-18 Cockpit Seating: Don't leave anyone behind with the spacious cockpit layout allowing you to comfortably accommodate up to 18 guests. 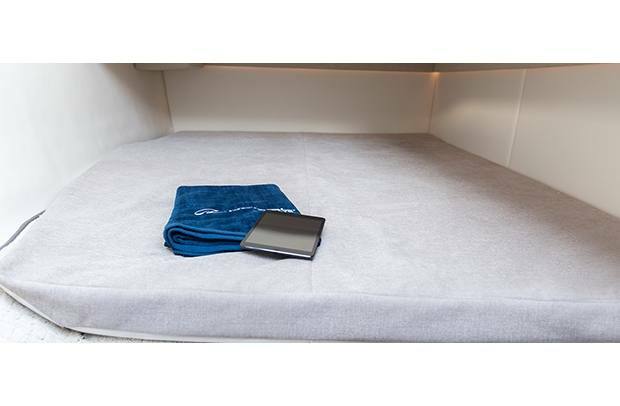 Quarter Berth: A queen bed with ample space tucked neatly under the cockpit. Refreshment Center: Entertaining is simplified with the expansive refreshment center, including a refrigerator, sink, trash can, storage, and optional TV, grill, and second refrigerator. Optional Hard Top: Hardtops are designed to offer the best of both worlds: Fun in the summer sun and cool, shaded protection when you're ready to take a break from the heat. The convenient retractable shade built into every 3300 hardtop is versatility at its finest. Automatic Bilge Pumps: The automatic bilge pumps take action before you even realize you need them. 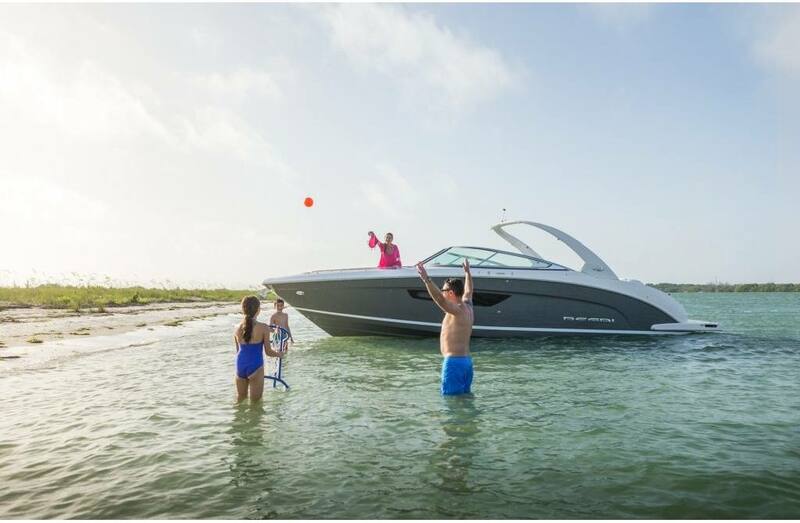 Automatic Fire Suppression System: An automatic fire extinguisher is sure to give any boater peace of mind. Dual Battery Switch: The standard battery switch will add longevity to the life of your battery. Integrated Self Bailing Drainage System: Keep a clean bilge with all your wash down and rain water draining directly overboard. Power Assisted Steering: Experience ultimate control. Trim Tabs: The standard trim tabs give you complete control over your boat even in the roughest of seas. Quarter Berth LED Accent Lighting: LED accent lighting adds a warm, luxurious feel to the quarter berth. Vessel Sink: A vessel sink is just another example of how Regals feature the latest trends and most stylish designs. Boarding Step: Climb aboard easily and safely with this fold away boarding step to starboard. Double Wide Social Seat: The multi-position backrest converts from a cockpit lounger to a bucket seat big enough to share. Hidden Refreshment Center Trash Compartment: The refreshment center comes standard with a hidden compartment for trash or storage. 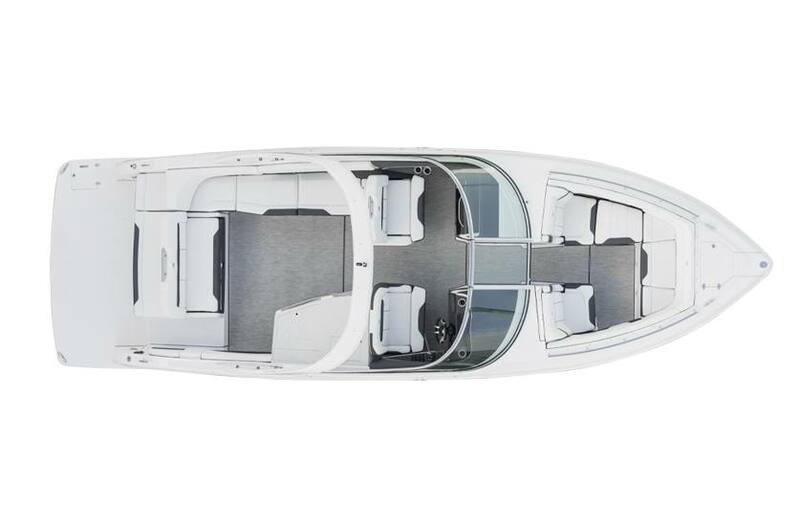 Multi-Position UltraLounge: Enjoy the transom in any position with the expansive and versatile UltraLounge. Refreshment Center: Entertaining is simplified with the expansive refreshment center, including a standard refrigerator, sink, trash can, and storage. Refreshment Center Refrigerator: Keep your drinks and snacks cold in the standard refreshment center refrigerator. Refreshment Center Sink: The standard refreshment center sink is perfect for keeping things clean. Transom and Bow Fusion Remotes: Thanks to the Fusion Remotes at the transom and in the bow, you are able to control your music from anywhere on board. Up-to-18 Cockpit Seating: The spacious cockpit layout lets you comfortably accommodate up to 18 guests and entertain them well. 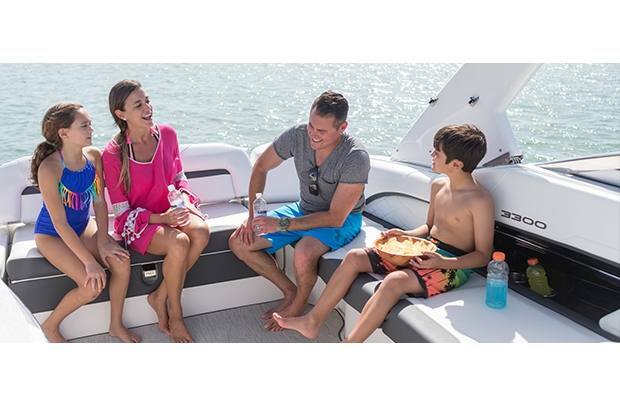 Fusion UD750 Marine Stereo: The Fusion radio has full integration for your smart phone, which can be enclosed in a waterproof uni-dock, and has AM/FM radio. Twin Binnacle Controls: When you're ready to take command, the twin binnacle controls place all the horsepower at your fingertips. Lighter. Stronger. Cleaner. Infusion. : Thanks to the advancements in boat building technology we are able to craft our boats lighter and stronger every single time. Optional Rod Holders: The optional stainless rod holders double as cup holders so you will never miss out when the fish are biting. Bow Thruster - This transversal propulsion device tremendously increases maneuverability; docking becomes a breeze. Cruise Package - Comes complete with fenders, dock lines, life vests, first aid kit, boat hook, and deck brush. Gas Vapor Detector - The gas vapor detector lets you know when fumes are in the air. Indicators for Trim Tabs - The trim tab indicator allows you to be precise. Merc Joystick Piloting - Any captain will dock with confidence thanks to full 360 control. Technology Package - Battery Charger, helm seat power lift, lighting package, underwater lights, docking lights and the stereo performance package. 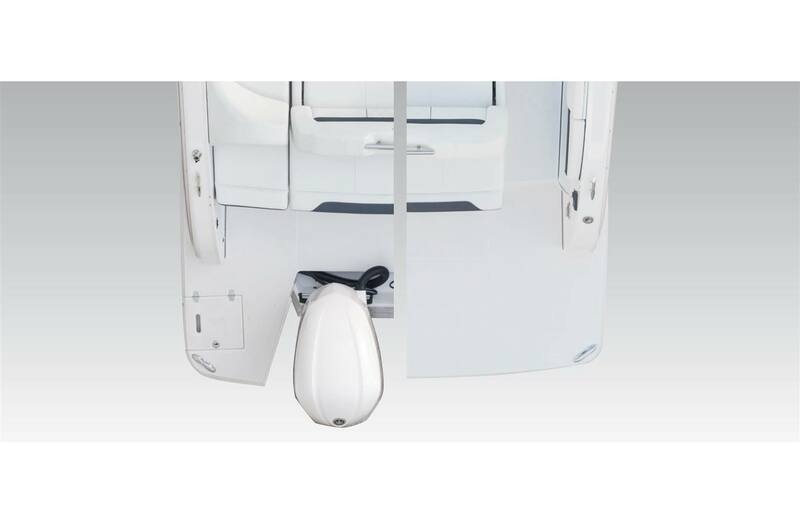 Toilet Electric with Pump Out Fittings - The silent flush electric head will make you feel like you are on a much larger boat. Port Light for Cabin - A little extra light while under the deck. Full Enclosure - The front, side, & aft connectors enclose your cockpit and keep out unwanted weather. White PowerTower & Full Enclosure Upgrade - Add classic style to your PowerTower and don't worry about unexpected weather with the full enclosure upgrade. Aft Cockpit Electric Sureshade for Hard Top - Enjoy extra shade off the transom on a hot day at the simple push of a button. Cockpit Refrigerator - The electric cockpit refrigerator provides for extra food and drink storage, as well as easy access. Electric Grill for Wetbar - Enjoy quick and easy lunch preparation. Flag Pole: Stainless Steel with U.S. Flag - The stainless flag pole is a great way to represent any nation. Grill-Gas - The gas BBQ grill is perfect for those looking to have some fresh fish or hot burgers for lunch. 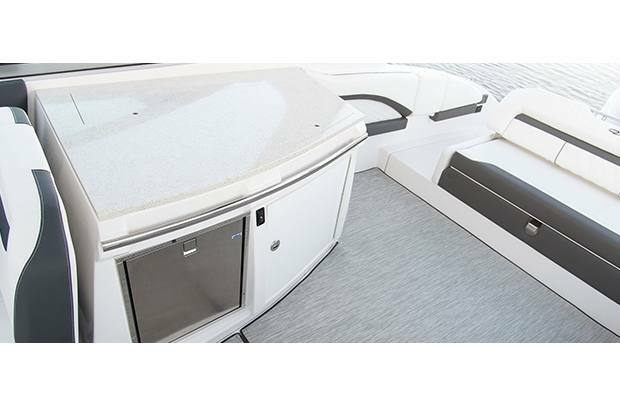 Premium Package - The Premium Package includes a bow filler cushion, cockpit table, and storage mats. Second Cockpit Refrigerator - Use this additional refrigerator to fit drinks or snacks for all your extra guests. Transom Door - The transom walk-thru door provides an extra level of security for the young kids on-board. Flexiteek - Cockpit Sole - Enjoy your beautiful deck instead of worrying about maintenance and leakage. Extended Swim Platform - The extended swim platform is low to the water making water sports activities easier. Fender Clips - 6 - No more tying and untying knots. Attach boat fenders quickly and securely with these fender clips. Rod Holders - If your looking to do a little fishing, the rod holders are just what you need. Swim Platform Rail - Add some extra Italian styling to your boat with a stainless, wrap-around rail. Water Sport tow pylon SS removeable - Tow tubers, skiers, wake boarders and any other thrill seekers behind you with the help of the removable stainless steel tow pylon. Windshield Wiper- Starboard - If you're looking to boat in rainy weather then the windshield wiper is a must. Hard Top - The optional hardtop not only adds style but helps keep you cool thanks to the retractable sunroof and minimizes the need for canvas. Teak Inlay - Swim Platform - A favorite with boaters, this addition creates a classic look. Cockpit TV - Enjoy your favorite show out on the water on a breezy day. Garmin 100 VHF Radio - The Garmin VHF 110 marine receiver features intuitive design and provides radio communication to enhance convenience and safety to mariners worldwide. Garmin GPS 7612 Chart Plotter - Built for peace of mind when it comes to boating in unfamiliar waters and integration of wifi connectivity for your mobile device. Garmin HD Closed Array Radar - Sharpen your radar picture with high definition performance. The radar offers a whole new level of radar scanning capability. Garmin Sonar & B60 Transducer - Garmin's sonar power and transducer capabilities provides you with optimum awareness of your surroundings. Volvo 12" Glass Cockpit & Auto Pilot - Simplify your boating experience by monitoring and controlling all driver information, including navigation, engine data, warnings, alarms and EVC Easy boating features, in one or more customisable, high-tech, touchscreens.